Australian police investigators sprung into action almost immediately when news of an alleged high level corruption ring involving locals and a few prominent Malaysians broke. We must salute the Australian police for their admirable professionalism and urgency in striving to nail the crooks, no matter who they are. This latest Australian episode gives us an inside to not only the level of professionalism but also the Australian authorities' strict adherence to the maxim 'not leaving any stone unturned in seeking truth'. Questions have now been raised if the Australian police had in fact notified their Malaysian counterparts before the scam was exposed by The Age newspaper. This is another affirmation that the Australian authorities are always 'on the ball'. I'm certain the relevant authorities on our side would be responding to the queries to avoid any allegation of attempts to sweep things under the carpet. We must also take cognisance that one of our former UTK policeman who has a noose hanging over his head here for the murder of Mongolian model Altantuya Shaariibuu has been under the protection of Australian authorities since his arrest. It has been more than FIVE months since Sirul Azhar Umar was detained in Brisbane. 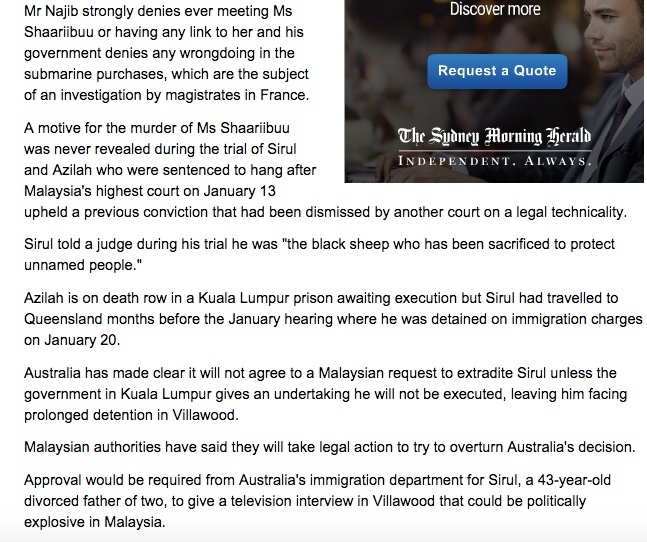 In five months Sirul has met and spoke with countless Australian officers and some Malaysians. It was learned that the Australians have been moving the convicted murderer of Altantuya between a few detention centers and Australian intelligence units safe-houses for safety reasons, while regularly recording fresh inputs and statements. It seems an individual with the initial RB has been highlighted in some latest detailed statements. The investigators, it was learned, have also got hold of a few Statuory Declarations which were made in relation to the murder of Altantuya, including a sworn statement by a fugitive blogger that is said to have corroborated Sirul's statement. Legally, this is all hearsay. An exclusive video interview has also been recorded on Sirul's own request, says a Melbourne-based journalist who is currently pursuing the Australian culprits in the Mara-linked property scam. 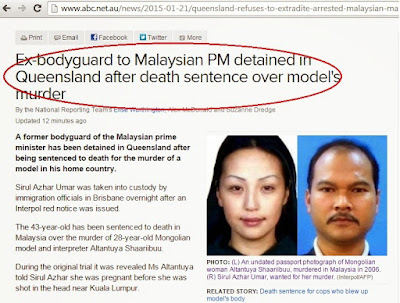 Could we now expect the Australian media to come up with an expose of yet another long-running Malaysian scandal? Guess its high time for Kuala Lumpur to put its foot down and demand Canberra to deport Sirul Azhar on the next available flight to Kuala Lumpur. Otherwise every convicted killer and conman would be making his/her way to Australia. 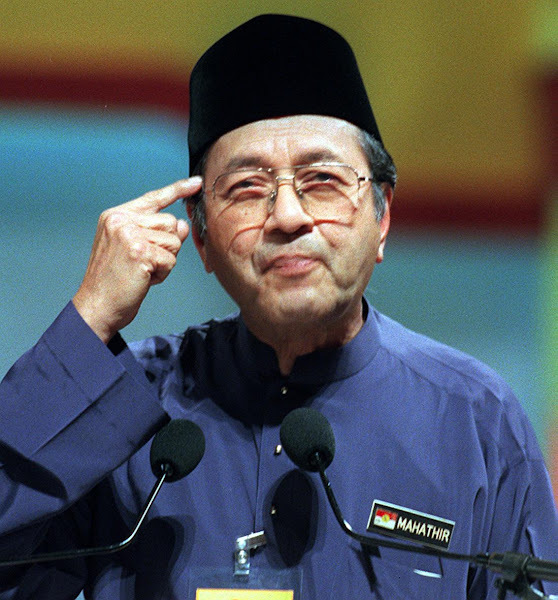 Can you do that Mr Prime Minister Datuk Seri Najib Razak or are you too busy with the 1MDB scandal? p/s Fairfax Media investigated the Mara-linked scam for about six months before the expose and Fairfax Media's investigative journalists have been working on Sirul's case from day one of his arrest... or even before that. Malaysia is officially the focus of the world for all the wrong reasons. Beware the Western people..nothing good they want from Najib and Mahathir..
All they want is to see Malaysian fall by itself.. Forget about Najib forget about Mahathir..it all about our future..
Anon 6 pm said Malaysia is officially the focus of the world. What say u, dear PM? Shame on you for having staff who inherited your 'pahlawan bugis' skills. Asyik melanun dan merompak je kerjanya!!! We the rakyat have nothing to hide, but it seems Putrajaya always has something to hide and somewhere to hide. Don't spill your beans over your ignorance mate. Those of us who are old enough know how friendly the Aussies have been since decades ago supporting so very many Malaysian students in Australian schools and universities. When this controversy happened you were in loincloth in sarawak. You hardly know head or tail of this issue and too lazy to get your facts right. Giveup la... your blog have no impact! RPK's local DOG must certainly have a very heavy impact, more than Apanama. 1. 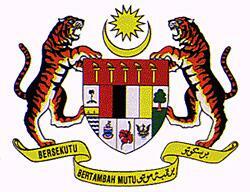 If I am not mistaken, I have seen APANAMA in kuching whilst working with NST. Wow, i did not realise the potential of this guy. 2. On thing for sure, only the dayaks in the jungle wore loin cloth and i have never ever seen apanama in it. He was smart weaing a necktie sending his child to a mission school in kuching. 3. To say his blog has no impact is likening to say najib is a pirate not a pm. 4. For me, najib is a forgone conclusion. 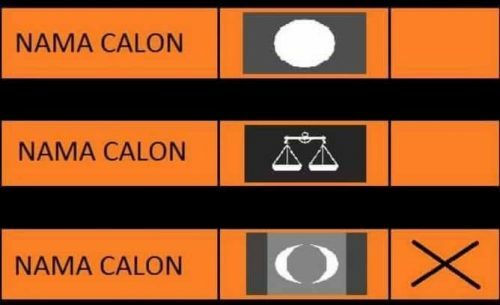 Umno will lose and so will BN. 5. Perhaps you fo not read other news or blogs other than shallow thinking peopke like you. 6. I have a friend holding high office in the state department. His west malaysian friend had asked him how the hell he obtained his colombo scholarship to study in australia. 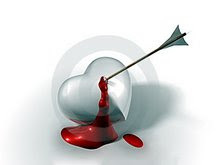 My friend answered, "well one day, whilst i was sitting on a platform atop a tree, a helicopter flew above me and lowered a letter addressed to me. The letter was about a scholarship offer to study in australia". His friend walked away after insulting my friend that sarawakians lived on trees. Got the message? 8. Which of the two SDs sworn by P.I. Bala is true? 9. 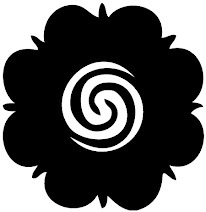 What happened to Carpet trader Deepak's Black Rose book? Looking forward for your expert answers. The above caption appears on Pg 27 of The Sun (30 June 15) and i salute KWAP for coming out with this statement whereby KWAP has clearly stated that “No gifts of any kind that are offered by the external parties will be accepted by any employee, at any time on or off the work premises”. The announcement is signed off “we thank you in advance for your understanding and cooperation”.This is a very apt policy and i strongly feel that all GLCs and other companies should follow suit. There is no need to send “costly hampers” to one another – which might take the form of expensive Chinese looking vases with some rare orchid, crystal dishes overflowing with Godiva chocs and some antique baskets stuffed with Melaka dodol, jam tarts and not forgetting the infamous London Almond cookies. As Ramadhan is a time for giving to the poor and needy, i am very sure heads and sub - sub heads of GLCs do not fall into this catergory. Whatmore Ministers and the PM? Perhaps the costly hampers with practical foodstuffs for Raya can be sent to the very needy at Manik Urai and all other flood stricken victims in Kelantan or Ramadhan Food Basket (Palestine). Ini tidak akan menjejaskan the wannabe entrepreneurs in the hamper business. I was told that in Singapore, this is strictly observed so no “designer hampers” are delivered to Minsters homes during the festive seasons but they can nominate their favourite charities and the cash or kind is sent directly to the deserving. Makes perfect sense. Perhaps we can learn a thing or two from dem folks. I am sure in Malaysia we have a GO (General Order) and i am very sure that the GO clearly states "that thou shall not receive"or perhaps it is an outdated GO and needs updating? Sorry to disappoint All the Datins & Puan Sris – no hamper from KWAP ya.